When I was touring around the Fulton St. Transit Center last Sunday, I noticed some of the escalators making funny noises. Considering the MTA’s track record with escalators, I should have asked someone about it, but the moment passed. Fast forward to Thursday when I spotted the following photo on Instagram. Need I say more? Open three days and the escalator is broken. This is why we can't have nice things. If you’d like some of those 1000 words to go with this photo, The Daily News has you covered. Pete Donohue ran a news item on the problems, and the paper’s Editorial team was not impressed. The MTA has pointed some fingers at Westfield Group as the party responsible for elevator maintenance, but MTA Capital Construction had control of the new building until last weekend. The buck stops somewhere. The problem with federal funding is how inflexible it is. The feds may be willing to pony over a significantly amount of dollars — upwards of one billion for certain projects — but that money can’t be shuffled around to better uses. It’s earmarked for a specific purpose, and the local agency receiving that money has to spend it on that purpose, even if agency heads know how badly they could use those same dollars for something far more worthwhile. Such are the contradictions of the Fulton St. Transit Center which will open to the public at 5 a.m.
On Sunday, politicians and MTA officials past and present gathered to celebrate the completion of the Fulton St. Transit Center, and in a way, it was a big deal. Two former MTA heads — Joe Lhota and Lee Sander — were in attendance as well as Mysore Nagaraja, the former head of MTA Capital Construction, who oversaw the start of this project well over a decade ago. Chuck Schumer, Jerry Nadler and Sheldon Silver didn’t miss the photo op either. Finally, the construction surrounding Fulton St. will end, and as tenants fill into 1 World Trade Center, the Fulton St. part of the Lower Manhattan puzzle is complete. But in another way, the fact that the Fulton St. 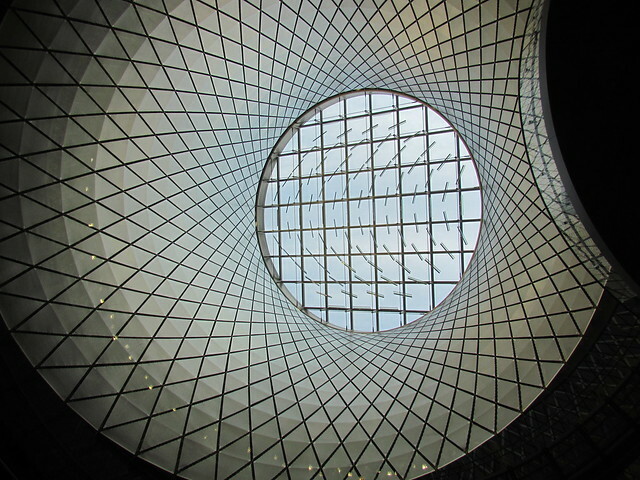 Transit Center even exists as a megaproject comes out of a different era in recent New York City history. Following the 9/11 attacks, politicians thought the best way to restore faith in New York and heal the wound to its psyche was to pump money into Lower Manhattan. It was, at the time, believed to be the only way to get people to return to the area to live or work or shop, and part of that money involved funding both the Fulton St. Transit Center and parts of the Calatrava World Trade Center PATH Hub. 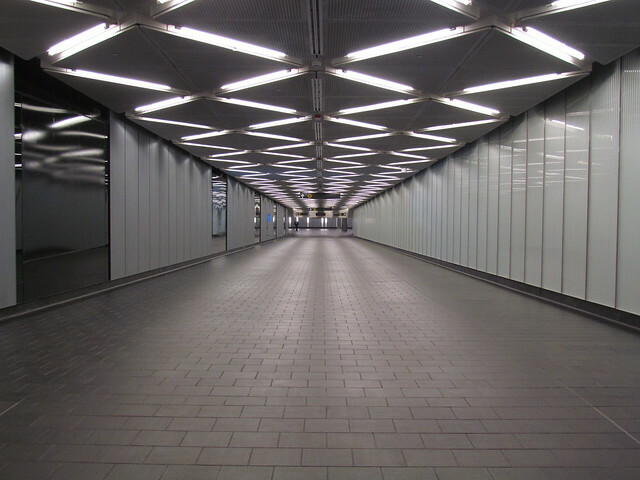 No one stopped to question whether the city needed to spend billions of dollars on two fancy subway stops, and no one could stop the political desire to create a public place and public space in Lower Manhattan. So what we have now is the Fulton Center. 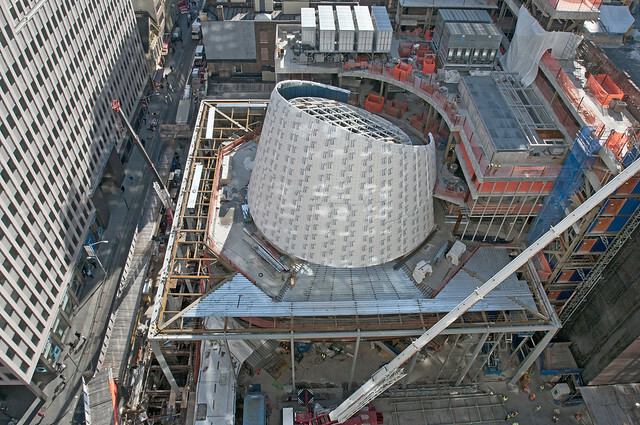 It’s a multi-level headhouse atop the Fulton St. subway complex, and it’s not all just an ornate building with an oculus and the Sky Reflector Net, an art installation that will bring daylight into the depths of the headhouse. It’s also going to feature 30,000 square feet of retail that Westfield will begin to fill in early 2015, and the renovations open up corridors that were cramped, dark and hard to navigate. It’s fully ADA-compliant, and when all is said and done in Lower Manhattan, it will serve as the eastern end of an underground passageway stretching from Brookfield Place on the Hudson River to the Fulton St. station complex via the PATH Hub and the Dey St. Concourse. The transfers between the PATH, the E, the 1, the R and all the trains at Fulton St. will not be free, but they will be easy and underground. 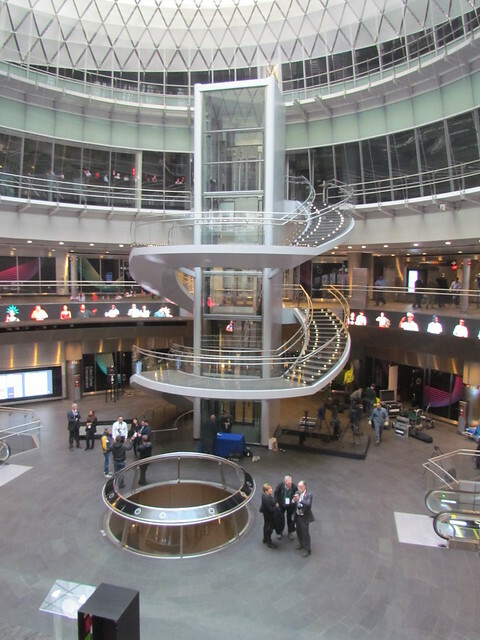 As I toured the new station on Sunday, I was struck by its size. There’s nothing quite like it in the New York City subway system today. While we’re used to cramped corridors with low ceilings and narrow spaces, the Fulton St. Transit Center is massive with wide open vistas and a lot of space for people. The transfer between the A and C platform and the 4 and 5 will be instantly easier and quicker, and the East Side IRT platforms are much wider. (The doors in that photo will always kept open; they can be closed in the event of the emergency.) The Fulton St. Transit Center will likely become a meeting spot and, as Therese McMillan, the Acting Administrator of the Federal Transit Administration, said, “an essential part of everyday life” in the neighborhood. Is it all worth it though? During his remarks on Sunday, Senator Chuck Schumer, quoting the late Daniel Patrick Moynihan, stated that great public works are always “worth the dollars.” But he also said the same thing about the Calatrava hub, and he’s a big supporter of Moynihan Station. These three projects are all, to varying degrees, nice to look at, but they do little to nothing to solve problems of regional mobility. For a combined expense of over $7 billion — the total of the Fulton St., PATH and Moynihan expenditures — the city could build train tunnels it needs rather than another fancy building. But the fancy building is what we get. So take a look around as you pass through there on Monday. Try to find the special edition MetroCard and marvel at what federal dollars can bring. It certainly doesn’t look like the subway system with which New Yorkers have a love-hate relationship. That alone is a step in the right direction, albeit a very, very expensive one. Is the Fulton St. Transit Center going to open on June 26th? Soon, riders will pass through the Fulton St. Transit Center. For now, we have only renderings. 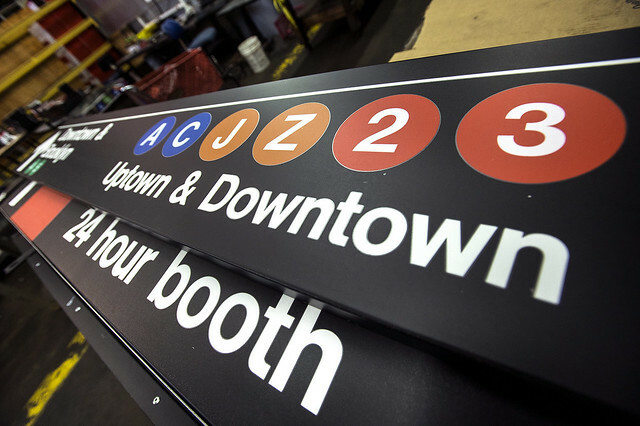 In late March, as part of a presentation to the its Board committees, the MTA announced an opening date of June 26 for the Fulton St. Transit Center. Years in the making and nearly 100 percent over its initial budget, the post-9/11 project — one of two massive retail/transit centers opening near Ground Zero — become the poster child for MTA construction mismanagement and the project Michael Horodniceanu vowed to deliver on time. Well, June 26th is eight days away, and the Fulton St. Transit Center’s opening date remains shrouded in mystery. 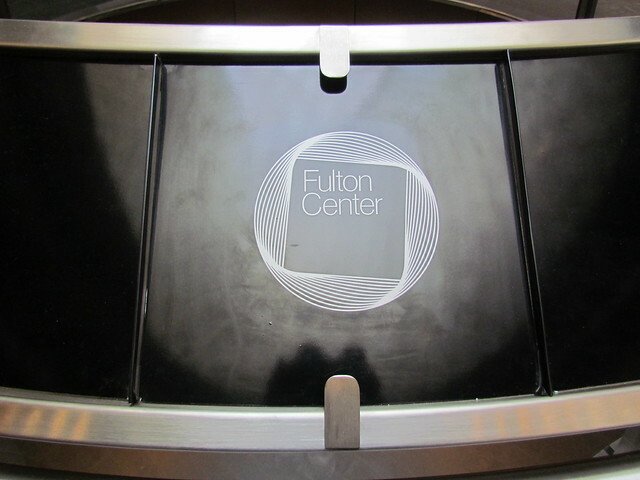 A few days ago, a few readers emailed me concerning the state of the Fulton St. hub. Since I’ve switched to the Brighton Line for my daily commute, I no longer pass through Fulton St. and haven’t had a chance to check out the project in some time. It’s clear that it will open soon, but just how soon is an open question. SAS readers have speculated that the project still has more than a week or two left, but the MTA can and has opened projects that are substantially complete with finishing work still required. So yesterday, I asked the MTA if the Transit Center is going to open on June 26th — next Thursday — and received a non-committal answer. “The date,” I was told, “will be firmed up next week during committee meetings.” Now, that doesn’t mean the center won’t open a few days after the committee readings, but if I were a betting man, I’d probably take the over. In the grand scheme of transit history, when the Fulton St. Transit Center opened will quickly become irrelevant. Five months after it opens, we won’t care that the MTA missed its initial promised date, and in five years or five decades, no one will remember. But this deadline bleed isn’t unique to Fulton St. After nearing completion, the South Ferry station opened a few months late, and the 7 line will be nearly a year late. All of these projects struggled to pass that finish line on time, and that’s a little bit of a problem as the MTA needs to retain its credibility to gain more funding. It’s the same problem that plagues staircase repairs, escalator installation and station rehabs. Now who thinks the Second Ave. Subway will start revenue service on time before the end of December 2016? Anyone want to place a bet? As time marches on and the subways enjoy record-setting crowds (more on that later), various capital construction deadlines are fast approaching. As we know, two megaprojects — the 7 line extension and the Fulton St. Transit Center — are due to wrap this year, after nearly seven years of construction. 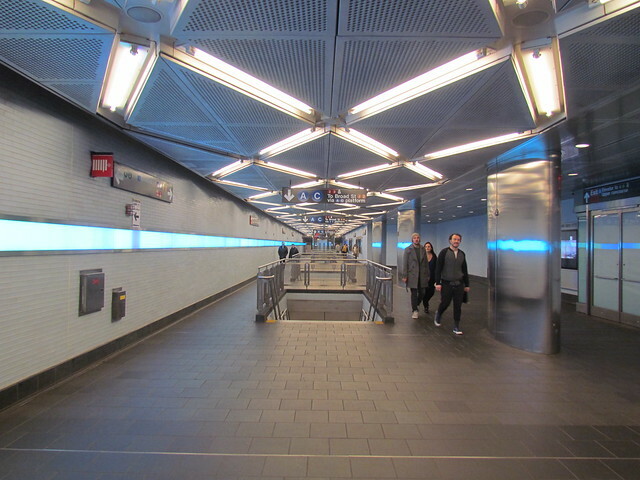 Due to the delays plaguing the escalators and elevators at the deep 34th St. station along 11th Ave., the Fulton St. ribbon-cutting has leap-frogged the 7 line. According to MTA Board documents released yesterday, Fulton St. will open to public on Thursday, June 26, 2014. Save the date. Meanwhile, mitigation work and acceptance testing continues on the Far West Side, and the MTA is still committed to delivering the 7 line in the fall, nearly 11 months later than scheduled. For now, the official word is still “November,” but according to an engineering report contained within the MTA’s materials this week, that date could hit December if problems aren’t resolved. The winter solstice is December 21. So the MTA has three weeks in December in which it is still technically fall to deliver the project. Hold your breath. Finally, over on the East Side, the Second Ave. Subway continues to be on pace for a December 2016 revenue start date, but the documents detail some slippage. Construction crews have burned through approximately half of the project’s planned contingency days, and a few delivery dates have been pushed back. Still, until we hear otherwise, December 2016 it is. That’s only 33 months away, and the real estate market is responding in turn. Westfield tabbed to bring retail to Fulton St.
With the Fulton St. 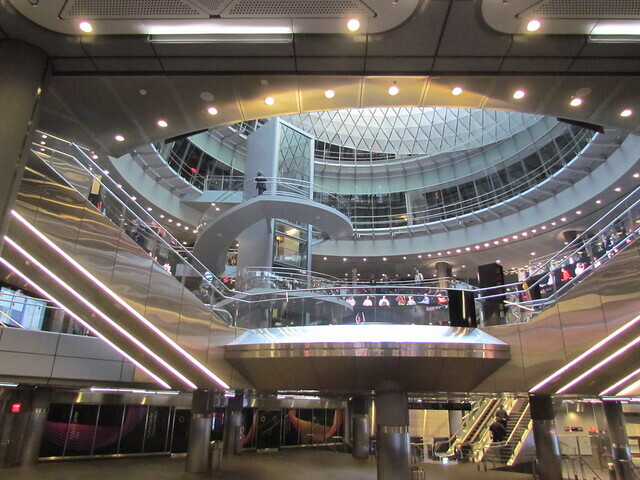 Transit Hub set to open within the next six months, the MTA has chosen the Westfield Group, an Australian mall developer will annual revenue over $4 billion, to serve as Master Lessee for the space. Westfield will now be responsible for subletting the ample commercial space in the new facility and overseeing ad sales. It will also have to maintain and clean the leased portions of the Fulton St. Hub, and the MTA will share in a split of revenues. The company will sign a twenty-year lease with two ten-year renewal options. The lease will commence in June when the building opens to the public, and Westfield’s responsibilities include nearly all of the non-station areas in the transit center, Corbin Building and Dey Street Headhouse. The space encompasses approximately 180,000 square feet including 63,000 square feet for commercial uses. The MTA anticipates retail in approximately 42,000 square feet, and I’m sure everyone would love a Lower Manhattan Apple store. The so-called “public circulation areas” account for 60,000 square feet, and the remainder is back-of-house. 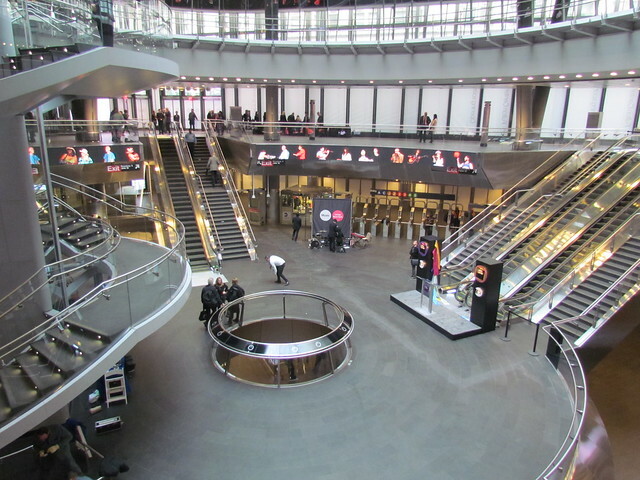 Now, the pressure is on Westfield to turn this new station complex into a shopping destination as well.